By Kori ~ August 30th, 2012. Would you like a quick suggestion for a good wine to drink tonight (or this weekend) that wonâ€™t break your budget and is widely available? Many of our readers have said this is something they would like, so here is this weekâ€™s selection, the 2007 Corpus del Muni LucÃ­a SelecciÃ³n from the Castilla La Mancha region of Spain. The Perea Contreras family founded Bodegas del Muni in their hometown of Villatobas, Toledo, Spain, in 2000. JerÃ³nimo Perea and his sister Paloma run the winery. The name Bodegas del Muni comes from the participation of one of the family’s ancestors in a battle by the river Muni in Equatorial Guinea, a trace of Spain in the heart of Africa. The winery gets its grapes, predominantly Tempranillo, from the family’s 267-acre vineyard. 2007 Corpus del Muni LucÃ­a SelecciÃ³n (Castilla La Mancha, Spain): 100% Tempranillo. Deep purplish red in color. Aromatic with blackberry, earth, bacon, and smoke on both the nose and palate. 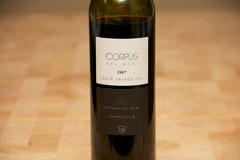 Medium to full-bodied with lively acidity and medium to high, very dry tannins, and a long finish. This sounds like such an appetizing wine. We were completely interested until you talked about the aroma of bacon! Yuck. We are both vegetarians and that kind of through us for a loop. I know it is a silly question, but do they use bacon? Do you have any recommendations for great wines for vegetarian meals? No, they do not actually use bacon in the production of this wine. The tasting notes are meant to give readers a sense of the aromas and flavors they might experience when tasting a wine. While bacon and other smoked meat aromas and flavors are sometimes present in red wines, the wines themselves are very much a vegetarian beverage. As for wines to pair with vegetarian meals, it really depends on what the meal is. In general, you should drink what you like, no matter what you are eating. But if you’d like to give me a specific meal you might like to have, I’d be happy to suggest a wine pairing. You might also enjoy a book we frequently use as a reference, What to Drink with What You Eat. Check out our review here: http://winepeeps.com/2009/10/16/book-review-what-to-drink-with-what-you-eat/. Cheers!